Today we’ve hit a major milestone as Star Wars celebrates its 40th year, and Disney Tsum Tsum is also marking the occasion with an all-new 40th Anniversary set available online today at DisneyStore.com. Today marks 40th Anniversary of Star Wars and to celebrate Disney is releasing a new Star Wars 40th Anniversary Micro Tsum Tsum Set. 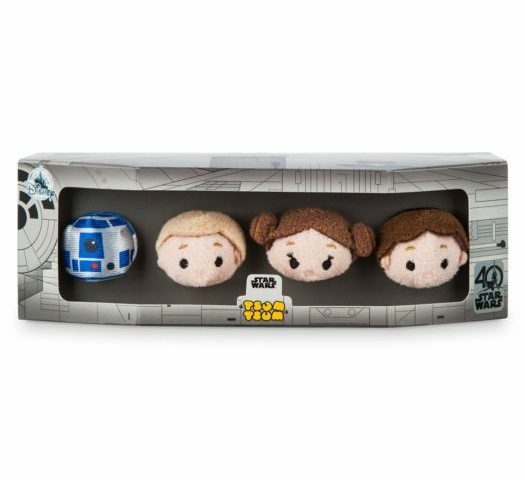 The new set features 4 Micro Tsum Tsums including Princess Leia, Luke Skywalker, Han Solo and R2-D2 . The set will retail for $19.95 per set and includes packaging that looks like the Millennium Falcon. Click on the link of photos below to order the new Star Wars 40th Anniversary Tsum Tsum Set today.